Religion Without God by Ronald Dworkin, of happy memory, was reviewed in the WP by Harvard political philosopher Michael Rosen. I haven't yet read Dworkin's latest book (though I certainly liked his Justice for Hedgehogs); but my understanding of it through Rosen's review makes me wonder what the fuss is all about. Dworkin and Rosen, like me, are "post-enlightenment" philosophers wanting to avoid basing our ethics and politics on some religious revelation or entity, but nevertheless avoid the relativism that does not allow for standards, values, and human rights that are consistent and universal and therefore useful for the development of local, national, and international law. So far so good. A worthy pursuit that in my simple mind is easily done and has been done. But methinks that they overcomplicate the effort. Take God out of the picture as the entity that creates, causes, or reveals those values and rights and there is a problem, they say. Yes, indeed I agree, for pre-enlightenment thinkers. But not for us. Also remove the spirit or soul along with its immortality as separate and distinct as well as eternal rewards and punishments and you remove incentives for morality and law. Yes, I agree, for pre-enlightened actors, but not for us. And so they argue for a religion without God in a secular materialistic culture that produces those values. That's okay I suppose, but unnecessary. Firstly, because there are and have been many religions without God and all of these founded moralities and still do. Secondly, because religion is a dimension of or identity with all cultures (including materialism). Thirdly, because standards, values, rights can be based in human nature and existence which can be known and experienced. Students of world religions have discovered many religions that do not worship or even talk about God. Religion is that part or dimension or description of culture through which humans personally and collectively find/make meaning. It involves a narrative that gives us a purpose, a place in the cosmos, a center or home, a way to deal with the messiness, chaos, and pain of day to day existence. It expresses a feeling of holiness or wholeness and a sense of transcendence that accompanies all human activity. The God narrative is a powerful narrative, perhaps beginning in ancient Egypt, that led to the three great monotheisms which are sub- or alter- narratives of the original. That narrative rationalizes and emotionalizes authoritarian rule, empire through conquest, good guys and bad guys, and dominance of the blessed (the rich). Cultural historians can link the God narrative to extended tribalism, holy wars, the divine right of kings and popes, and the making of enemies. But there are other cultures with other non-God narratives which rationalize and emotionalize personal and collective behavior including "transcendent" values that ground morality and a human way of life. Many of these are often interpreted by those imbued with the powerful God narrative whereby Great Spirit, First Cause, Mother Earth or Gaia, Father Sky, Void, Nirvana, Brahmin, Reason, Nature, Universal Spirit of Life and Love, even the Singularity are substitute names for God rather than alternative narratives. But indeed they are. More significant to human history (according to Henri Bergson and Karen Armstrong) than the developing story of God was the "great transformation" during the Axial Age when, throughout most cultures, a mighty flood uncovered the great human capacity for empathy or compassion, which was recognized and extended beyond tribal boundaries. Strangers were recognized as brothers and sisters. Neighbors, (as in who is my neighbor? ), were seen beyond my normal boundaries and even extended to "enemies." And every great religion began to fashion its narratives and teach in accordance with the recognition of the identity with and dignity of all humans, even to all living beings. The God narrative retold by prophets (as opposed to priests) who caught the insights of the great transformation now rationalizes and emotionalizes resistance, rebellion, and revolution against dominating rulers and rich patrons. Ironically the new insights and revised narratives by the prophets who are considered founders of the big three God religions were subtlety rejected by their successors who led their following to a reenactment of the original tribal narrative of authority, purity of race and doctrine, exclusion, and conquest. Revolution betrayed. Religion as a part, dimension, or product of culture is everywhere. Taking God or immortal souls out of religion doesn't eliminate culture/religion, it just changes it. So is changing the understanding of what is meant by "God." When Jefferson wrote "endowed by his Creator with certain inalienable rights," he wasn't talking about the prevalent Christian concept of God as a parental entity up there in heaven. He was more in tune with Spinoza's God which is Nature and all its laws. Pretty much as we speak today of Evolution as a quasi divinity unfolding life in the cosmos. For Dworkin, religion is the "assent to a reality that cannot be achieved by positive science." Since Karl Popper's philosophy of science, that means a reality that cannot be falsified or verified by evidence. Dworkin wants to preserve religion (without God) because he wants to affirm the "full independent reality of value." He thus "rejects the view that nothing is real except what is revealed by natural science or psychology." Well, so do I. But that doesn't mean that we need to assent to religious truth to save value, as says Rosen. Nor I think do we need to fear that our values are just the "penumbra rays from revealed religion" (Nietzsche) which once extinguished will throw us into a valueless and lawless existence. That to me is just a misunderstanding of culture and its three main products of religion, science, and art (which also have by-products too numerous to mention here). Culture is the formal symbolic expression of human existence in both the private and public realms. [I contrast culture with, and relate it to, economy which is the realm of private biological survival or life (family, household, tribe) and with politics which is the realm of the social, interdependent, or public (nation, state, country, international order.] Religion is the narrative with rites and symbols that stimulates and responds to reverence in and gratitude for human life and action. Art is the narrative with symbols, pictures, sounds, movement that provides and responds to wonder in personal and collective life and action. Science is the narrative that stimulates and responds to curiosity. Religion, in responding to reverence, searches for meaning. Art, in responding to wonder, finds beauty. Science in responding to curiosity provides understanding. They can be seen as three different ways of knowing or three modes of encountering the world or contacting reality. And I would argue that values and their foundation in human existence can be discerned in religion, art, and science. Is religion the source of morality and law as Dworkin apparently argues? Yes, but so is art and science. And ultimately the foundation of morality and law is the inherited and created structure of human nature and existence itself accessible through religion, art, and science. All three are human symbolic ways of dealing in the world and encountering reality including the reality of human existence in reality. One is more expressive of reverence and gratitude, another more expressive of wonder and astonishment, and the other more expressive of curiosity and understanding in our world wandering. Some narratives include gods, forms, and laws, some do not. Some narratives are more ritual and some more discursive. All use images or symbols, all have emotional and rational sides, all feed into the others, and all have a quality of transcendence--a drive to go beyond the here and now while situated in the here and now. What the book, the review, and perhaps my reflection do point up is our ever present need and desire to create new, more inclusive, more constructive, and more humane narratives (with or without God) that will enhance the values that we can experience, intuit, and understand in our own personal and collective human being. I just returned from the New Partners for Smart Growth conference in Denver organized by the Local Government Commission. This is a very productive annual conference in which government, business, and community organizational partners tell each other their accomplishments, failures, and learnings through projects in green infrastructure, compact development, linking urban/rural food systems, preserving land and water, reducing carbon emissions, clean energy use, linking homes and jobs through transportation oriented developments, creating new economy jobs, and ensuring equity in everything. All this can be summarized as creating healthy communities with vibrant economies. Everybody at the planning table: government, business, labor, health institutions, creative developers, youth, non-profit mission driven agencies, and local communities. Each having its own mission, but relating that to an overriding vision and collective mission. Engage local communities (i.e., publics), organized through powerful community organizations, driving the process and pushing for results based on community interests, values, and affiliations. Community based power is essential to the process. Align resources through partnerships, e.g. the federal agency partnership aligning innovating funding, local government partnerships aligning towards local and regional outcomes, national and community foundations aligning private and public investment and supporting the communities in building power in the partnership. Create, explore, and use the tools: community organization, fiscal impact, environmental impact, health outcome, GIS mapping, comprehensive interests and values survey, data collection, and collective design tools. Cut across boundaries: see how rural and urban affect each other, watch language so as not to be pigeonholed as liberal or conservative, translate technical terms into common sense terms, let data speak for itself through pictures, pursue diversity in race, ethnicity, sexuality, age, income. Using the good community organizing that is already being done to position both rural communities and urban neighborhoods into powerful positions. Bringing the movement and its many successful experiments to scale by transforming the present political economy which is actually increasing poverty, undermining equity, blocking health, fouling our habitats, and destroying the planet. 1. We are missing a tremendous resource by not engaging the organizations that have been building power in communities and the networks which have been helping them get funding, training, and quality organizers. For example, the prevalent model for SC2 (Strong Cities, Strong Communities) of the White House Council and even the Sustainable Cities Initiative is getting high level technical consultants connected to local mayors and other government officials who bring in "the community" later to test their hypotheses or worse to sell them on their solutions. Since they seem to want to fund "consultants," I suggest that besides "private professional consultants," we fund "professional community consultants" which are the organizations and their networks that are already in place or have the wherewithal to build powerful local vehicles for ordinary people to experience and assert their power. I will keep trying to work with the Federal Partnership with which I was a part in California and now in DC to do that. However, part of the problem I discern is with the organizations and their networks themselves Because they do not see the bigger picture or avail themselves of the opportunities. They get caught in their single-issue campaigns, are too cautious about working with government agencies, and do not know how to or are too arrogant to collaborate with one another. I think there will have to be some one-on-ones with open-minded, non-threatened leadership where they can articulate their concerns and help design the process. That might be a big order. The feds need some quick, concrete results. The professional technical consultants don't recognize the need or know how to build community people into the process from the beginning and with power. And professional community organizers are often stuck in their old ways and don't see the opportunities for broader change. 2. What also was missing for me was the radical analysis that identifies the political economic structures and processes that are both creating the poverty, inequity, and environmental devastation that we were trying to deal with, as well as preventing the bringing of successful experiments in community development and new economy to scale. This analysis includes the clash of classes and the institutions that represented them. I am of course thinking of many large corporations and financial institutions which are speculating in land and gambling for short term winners. As Doug, one of the participants said, all those who invest in "fast money" that simply enriches the Wall Street casino owners, rather than the "slow money" that takes time to multiply in community benefits. Because of the lack of such analysis, these wonderful experiments are not becoming power centers for transformation at the state and national level. As Doug said (and I loved his metaphor) we are working in the eddies and missing the roaring river that is washing all of us away. Instead we have a sort of "thousand points of light" strategy without the combination into the light that would enlighten and vivify the whole world. Now I would not expect government agencies to raise this analysis nor the private consultants that rely on government and corporations for support. I mean the analysis of shareholder corporations, freely speculating financial institutions (now creating new bubbles), continued investment in fossil fuel infrastructure, rule of government by the rich through their lobbyists and payments to government officials, and support of fast over slow money activities. But hopefully the "community consultants" could raise this analysis and the policy implications of this analysis: stakeholder corporations with worker councils, community over national banks, investment in clean energy infrastructure, prohibition of political payoffs, reduction of trade imbalance and global debt, and climate justice through economic democracy. When I was learning community organizing in the 1960s and 70s, I worked with Jack MacNamera and Fr. Jack Egan with the Contract Buyers of Lawndale (CBL) that expanded to be the Contract Buyers League in Chicago. It was an incredible experience in which the central dynamic of racial housing segregation and its relation to inequities in jobs, education, services, and income was exposed. We learned that racism did not consist in the enmity that some white people and black people felt towards each other, but in the patterns of real estate development and the financial practices supported by government that used and reenforced that racial antagonism. The organizing stopped much of the redlining in Chicago and the HUD/FHA underwriting of that redlining. It was a great and successful experiment on the march to racial and social justice. At the same time other community organizations were developing in communities that were being torn by blockbusting, racial fear mongering, and financial institution redlining. Austin was one right to the west of us being organized by Tom Gaudette and Shel Trapp who were advising us in Lawndale. But it was Shel Trapp to whom I give most credit, along with Gale Cincotta, for taking the redlining practice and pushing it to national policy level after organizing many communities being threatened by the practice into National Peoples' Action. NPA took on HUD and got them to change regulations and Congress and got them to pass the Community Reinvestment Act to change a major structural practice that exploited poor people and caused racism. Both political parties ultimately adopted this policy and enshrined it in legislation. For awhile at least. I tell this story to suggest a sort of revolutionary progression in community action. Of course the big banks and their practices with Wall Street remain. Taking advantage of deregulation and new financial investment tools, they were largely responsible for the recent housing bubble and the exploitation of much of the middle and lower class. So the revolution is hardly won though the Occupy Wall Street Movement has started shining a larger light on these institutions and our fast money economy again. The progression in revolutionary movement goes from a) successful local organizing and experiments to b) deeper structural analysis and broader national organizing with local constituencies and power to c) state and national policy change to d) transformation of the political economy. This requires local community power organizing, radical class and institutional analysis, broad based organizing for policy change that will lead to the transformation of political and economic institutions. So the challenge is local: community organizing for power. But the challenge is also intellectual/spiritual: engaging people at all levels in an analysis that goes to the roots of the practice and the very values that support that practice. And it is national and transnational: pushing to a new political economic order that emerges through the community power and understanding process that can capture or create a political party for transformative change. Using and modifying Hannah Arendt's political thinking, I consider three dimensions of human being: The basic being that of life itself, the realm of necessity and self-interest, the private realm of household affairs or economy; the second being that of meaning and value expressed in ideas; the third being that of power, the ability to act in concert, where speech and action create the public realm of freedom. All lead to dignity and respect, which is the highest of self-interests, meanings, and powers. Each has its own institutions, e.g. the family, the business, the school, the church, the government, the community organization. While there are distinctions, e.g. public and private, self and other, there are also relationships and interactions among them, e.g. personal and civil religion, voluntary and necessary organizations, non-governmental and governmental agencies. I don’t mean to imply by this framework a hierarchy of needs (Mazlow) but more a hierarchy of human existence and behavior. 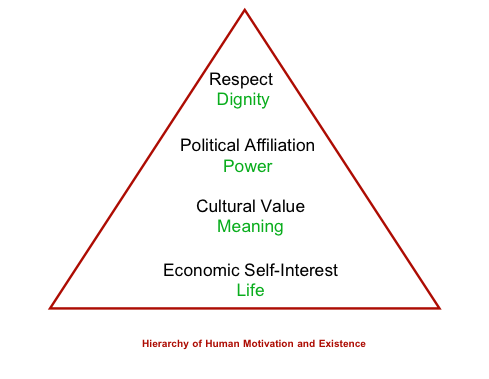 These dimensions are not stages one goes through; and all are important to being human and are marks of being human whether in prehistoric or postmodern times, in Eastern, Western, Northern, and Southern lands, in rural or urban societies. I don’t mean to imply that one is more important than the other in some absolute way. I do mean to imply a hierarchy on an ethical scale so that while politics (the polis or freely organized society) should assure what is necessary to life for all (economy), freedom/power (politics) is worth dying for and is not to be subjected to household affairs or economy--as it is largely the case in the US today. I think that politics should guarantee cultural liberalism but not economic liberalism. I also think that not making these distinctions promotes confusion in our way of speaking and acting. One example of this confusion is the liberal/progressive vs. conservative/libertarian argument that dominates political thinking in the US. Another is the use of capitalism vs socialism as if there are simply two alternatives to economic justice. The right to life vs freedom of choice discussion gets confused as if these are two contrary options (and shows why Pope Francis has his priorities correct). So many divisions among ordinary Americans are the result of the wrong framework often spurred by those whose interests are to keep American's divided on cultural and political matters without seeing how the economy is structured to create and sustain losers and how the culture and politics are being controlled by those with the most economic wealth. This framework also shows an interrelation, limitation, and hierarchy of rights and responsibilities. For example, the right to speak and act and organize (politics) is most important but should never be used to deny the right to enjoy one’s own values, as long as those values do not undermine the right to speak, act, and decide together the shape of the community including its governance structure. It helps explain the difference between household, denominational, and civil religion and how I can be a religious atheist or have an understanding of God different from most of the denominations or how we can embrace the separation of church and state and still respect religious values in influencing state policies. All these dimensions are important but in different ways. We can’t have political freedom or culture without life. But life (and making a living) without values is pretty meaningless—“an unexamined life is not worth living”. And life without politics denies us the highest values of freedom and power, which are worth ending life or abandoning one's culture for. Also this framework helps me separate and promote politics apart from government and shows that the public sphere is not at all confined to government agencies. So you can have a public school and agency that is not under or paid for by or through government. Leninism’s big mistake was indentifying socialism with state control and of the state with the Party. Just as the church (synogogue, mosque) is one important institution of the cultural/religious sphere, and the corporation (including businesses, unions, coops) an important institution of the economic sphere, so is government (including parties and state agencies) one important institution of the public sphere. The reason this is a helpful framework to think about organizing the next American revolution is its multi-dimensional understand of humanity—all of which have to be attended to in the organizing process: self-interest for a thriving life, values coming from and rooted in many cultures/religions, and affiliation, brother and sisterhood, comradeship, that crosses racial, cultural, and jurisdictional boundaries. I know all these can be-considered self-interest as when Alinsky says that when you push self-interest far enough if means love of neighbor; and all can be considered values; and all can be considered rights and responsibilities or matters of social justice. But I remember Chairman Charlie Baker’s talk with the Contract Buyers League in Chicago when he said: “I’m now glad that I bought my house on contract (i.e. was cheated and robbed) because it brought us all together.” He was making a huge transition from economic self-interest to political affiliation. That’s when I started really probing for values and relationships in my listening processes and my analyses. Indeed, contrary to Alinsky, some pastors do care about values and relationships as much as the Sunday collections. Faith and transcendence also belong to political action and the coming of the next revolution.